This morning, in their online version, HERE, the Daily Pilot reports that Costa Mesa Mayor Pro Tem Allan Mansoor and his campaign barnacle two years ago, council woman Wendy Leece, have announced their choices for the three contested seats in the November election. To no one's surprise, they didn't choose Katrina Foley as one of their favorites. They did choose Mayor Eric Bever, former Mayor Gary Monahan and the carpet-bagger, Jim Righeimer. Of even greater interest is the fact that they chose to make this announcement before the filing period has officially closed. Because Linda Dixon chose to "leave her seat open" ( a very unfortunate bit of headline writing on the part of the Daily Pilot), the filing deadline was extended until Wednesday at 5 p.m. It is still quite possible for other interested parties to pull papers, acquire the required signatures, fill out the forms and return them. 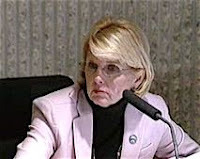 It was a given that Mansoor and Leece support Bever for re-election. Mansoor stepped aside so Bever could become mayor during this re-election year, providing him with a more visible platform from which to display his limited stand-up routine. I'm also not surprised that they will support Monahan's quest for yet another turn at the trough. In the last couple ye ars of his last and hopefully final term he shifted gears and joined Mansoor and Bever to form an unsavory majority. Gary has demonstrated more than once that he's in it for himself first, most recently when he proposed that the city directly elect the position of mayor. We assume he saw himself akin to Idi Amin Dada - Mayor For Life. Re-electing Monahan would not be in the best interests of the people of Costa Mesa although it would certainly enhance his pension and benefit package. You will recall that he's the only council member to ever qualify for a pension. And then there's Riggy... This one was a slam dunk for Mansoor and Leece. Two years ago Congressman Dana Rhorabacher and OC GOP honcho Scott Baugh provided tons of support for Mansoor's candidacy and he dragged Leece along for the ride. She ran virtually no stand-alone campaign of her own. 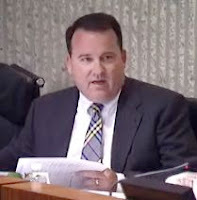 Mansoor began the payback process when he appointed Righeimer - who had lived in Costa Mesa only a few months - to the Planning Commission, rejecting long-time "improver" foot soldier Paul Bunney three times. Supporting Righeimer - Rhorabacher's re-election campaign chairman, by the way - for a council seat is just more payback for the support that got them into office. Electing Bever, Monahan and Righeimer to the council along with incumbents Mansoor and Leece would be disastrous for our city. There would be no divergent viewpoints on the dais - no way to keep them honest. I firmly believe that, before Mansoor and Leece's terms expire in 2010, we would see eminent domain imposed to grease the skids of redevelopment on the Westside, despite the fact that Mansoor has adamantly proclaimed he was against it many times. No, an absolute majority of "improvers" would turn our city into one governed by a virtual junta and guided, at least in part, by the ravings of a White Supremacist cave-dweller from the north part of town. On that happy note, I will remind you that the first of what is expected to be several candidate forums is scheduled to occur next week. Mesa Verde Community, Inc., the Mesa Verde Homeowner's Association, will again host what has historically been the first and best of the forums on Thursday, August 21st at the Neighborhood Community Center at Lions Park near the library. The event begins at 6:00 with a brief "meet and greet" opportunity, with the formal program beginning at 7:00. This will be your first chance to meet with the candidates and to see them as they present their platforms for your consideration. Unlike Mansoor and Leece, I'm eager to hear what ALL the candidates have to say before anointing any of them. As they say, be there or be square. You stated the date of the 1st forum to be: "Thursday, July 21st at the Neighborhood Community Center at Lions Park near the library." Is it possible you meant August 21st??? Monahan has been off the council for 2 years or, in other words, half a term. Is this what the city and its voters had in mind when they imposed term limits? Meanwhile he took a seat on the sewer commission where his main contribution was to raise his own salary. What was his major accomplishment during his former term (3 terms, 12 years) in office? DAILY PILOT PUBLISHER TOM JOHNSON RESIGNS!